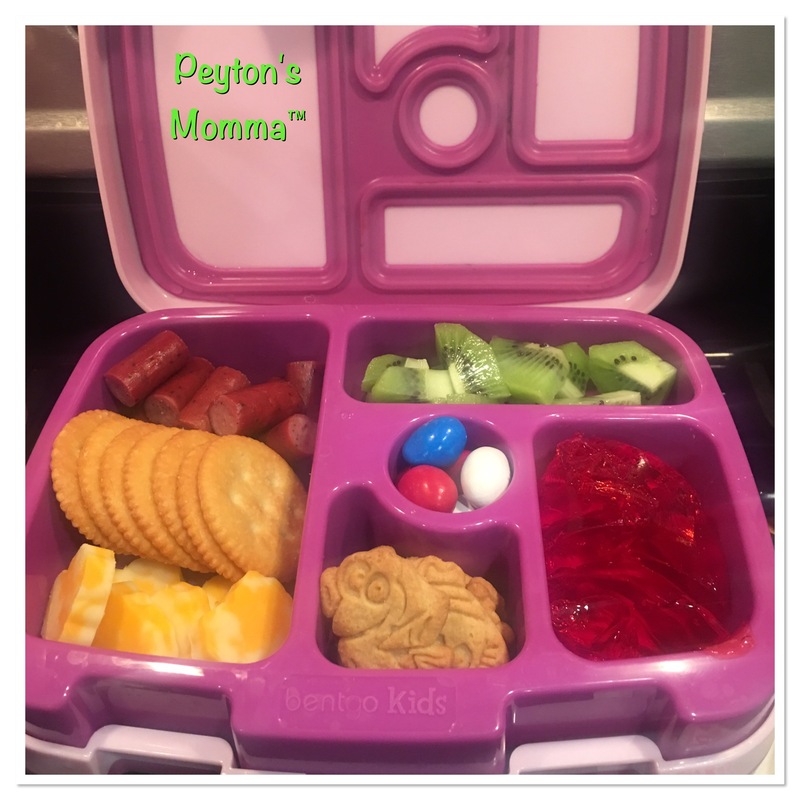 I’m trying to break Peyton of peanut butter and grape jelly sandwiches so today I made a cheese and cracker lunch box! I took a mini heart cookie cutter with a scalloped edge and cut out 6 Colby Jack cheese hearts. I like to buy the rectangle individually sliced cheese to do this with. I use about 3 slices per bento box meal. And then I have them for my lunches if I want to use them too. I switched out the beef sticks I normally buy to turkey sticks. Just thought turkey would be a little healthier than beef. Plus it’s a slightly different flavor and it adds variety to Peyton’s lunches. I finished off the main dish with some Ritz crackers. I was trying to make this a colorful bento box. With that in mind, I took a medium kiwi and sliced it into bite-size chunks. To keep the rainbow going I added strawberry jello. Who doesn’t like a little jello in their lunch? I really didn’t want to do another cracker but I was running out of choices when I looked into my collection of snacks. So in the bento box went Finding Dory graham crackers. And I finished her lunch off with red, white and blue peanut M&Ms. We will keep our red white and blue theme going all through the Olympics.